The regular triggers for terrestrial disasters, whether natural (earthquakes; tidal waves; eruptions etc) or manmade (wars; terrorism; crashes, etc) seem to be the eclipses and the Moon Wobble. Rob Tillett, one of the founders of Astrology on the Web, explores the meaning of this major cosmic phenomenon. If you thought Mercury retrograde was a problem, compare the Moon Wobble! In addition to the planets, asteroids, comets and moons that revolve in our solar system, astrology considers the effects of two "Shadow Planets" called the Moon's Nodes, the Dragon's Head and Tail. These nodes are not real rocks, like the Moon, Mars or Venus, but sensitive points that mark the movement by declination of the Moon from the southern celestial hemisphere to the northern (the North Node) and vice versa (the South Node), where the path of the Moon around the Earth sweeps across the ecliptic, intersecting the apparent path of the Sun. The nodes form an axis, so the South Node is always directly opposite the North Node in a stately cosmic quadrille. 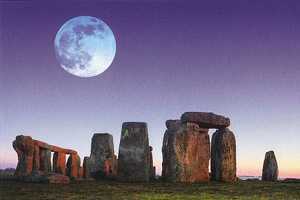 Nevertheless, the Moon's Nodes are vitally important in terms of the destinies of all who dwell on Planet Earth. See The Moon's Nodes for more on this. I was originally prompted to write the first edition of this article because of the devastation wrought by the May 2008 earthquake in Sichuan province of China which killed thousands, the horrors of Cyclone Nargis in Burma (Myanmar) which slaughtered tens of thousands and left millions homeless, deadly tornados in the USA, bombings in the Middle East and so on. There were a number of astrological pointers, including the stations of Saturn and Jupiter, the two Great Chronocrators, with Neptune and Mercury about to turn retrograde, but the significant trigger might well have been the stressful square aspect of the Sun to the Moon's Nodes on May 13, 2008. This phenomenon is known as a Moon Wobble. There have been further major disasters associated with Moon Wobbles already this year, 2010, as there are every year, including the widespread earthquakes and flooding associated with the Wobble before the New Moon Solar Eclipse in Capricorn on January 15, 2010, and of Saturn turning retrograde opposing retrograde Mars on Jan 13. The most striking so far in the current cycle have been the horror weather in the US, Europe and Australia, a series of minor earthquakes, then a catastrophic quake which has shattered Port-au-Prince, the capital of Haiti, in the Caribbean, on Jan 12. This occurred just one day after the peak of the Moon Wobble. It's significant that a Lunar Eclipse occurred on New Year's Eve exactly conjunct Haiti's natal Sun in the 11th degree of Capricorn. The Moon Wobble (the exact conjunction of the Sun with the North Node) occurred on Jan 11 in the 22nd degree of Cap. The Earthquake occurred the next day, with the Sun and Venus tightly conjunct the North Node, transiting Pluto exactly conjunct Haiti's natal Mars, and transiting Mars retrograde exactly conjunct Haiti's natal South Node. Interestingly, the earthquake Moon is exactly conjunct the Galactic Core, a profoundly potent cosmic location, again first discovered in the 1930's. It's notable that Haiti is currently undergoing a Saturn Return, with earthquake Saturn stationary about to turn retrograde (Jan 13) in tight conjunction with Haiti's natal Saturn. And to top it off, a Solar Eclipse will occur on Jan 15. So the moon-wobble and the eclipse cycle is not the only weakening factor, as other aspects have to be considered. But when these aspects coalesce—and there is a Moon Wobble—you can bet that the trigger will be the moon-wobble. Geo-scientists did warn months before that Haiti was on an unstable fault-line, but had they paid attention to the eclipse and moon-wobble cycle, the people could have taken precautions. Since that time there have been a number of heavy disasters, notably flooding with loss of life and massive dislocation in spots across the world, not all related to this phenomenon. However, as the next one approaches on July 4, the pace is hotting up. You can see the list of moon-wobble associated disasters for yourself in the table at the end of this article. Moon Wobbles were discovered in the 1930's, when research by astrologer Carl Payne Tobey (1902-1980), the original editor of Astrology Magazine, revealed that disasters occur in cycles associated with the conjunction (0°), opposition (180°) and square (90°) from the Sun to the Moon's Node. These powerful contacts occur when the Sun and the Node are in the same sign, or the opposing sign, or when the Sun is in a square aspect to the nodal axis. They are especially potent when the New Moon or Full Moon are square to the Nodes. On October 18, 2009, we saw the New Moon in Libra forming a partile square to the Nodes, emphasising the potency of the aspect, for the Sun and Moon are both precisely square the nodal axis at the New Moon. As he discovered after a painstaking examination of a large number of major disasters, many of the most serious and traumatic catastrophes involving fire, bad weather and loss of life occur in association with eclipses, when the Sun and Moon are conjunct the Moon's Nodes, especially when other unfortunate planetary aspects coincide. However, not all of these evils are exclusively linked with eclipses, for many are associated with the Sun forming a T-square to the nodal axis, i.e. when the Sun is in a 90° aspect to the nodes. This he called a "Moon Wobble", because in fact it is when the Moon is "wobbling" in its path by declination. So when the Sun forms an aspect to the nodes of 0°, 90°, or 180°, we experience a significant likelihood of massive environmental damage with much loss of life and property. These Moon Wobbles occur every 86.5 days on average, with an orb of approximately 5 degrees (days) on either side of the precise date, when the Sun forms either the T-square with the nodal axis, or the conjunction with the North or South Nodes. Tobey notes that when the Sun squares the Nodes, judgement is notoriously poor and unstable, especially for people under stress or in leadership positions. Some astrologers hold that the two weeks before the partile aspect are problematic, with the week following the aspect also being notable in terms of disasters, but my view is that we can allow 10 or more days on either side of the peak aspect, as shown in the table. The Sun takes a year to complete one revolution of the Zodiac, usually making four or five contacts with the Lunar Nodes in the process. For example, during the current Capricorn/Cancer nodal transit, which commenced in July/August 2009, the Sun in Libra reaches the Square aspect with the Nodes on at the New Moon of October 18, 2009, and again on September 30, 2010. When the Sun is in Libra on Oct 18, 2009, the New Moon makes a square (90°) aspect to the Nodes. This is a truly powerful aspect. When the Sun is in Capricorn in January 2010, we will see the conjuction of Sun and North Node (an opposition to the South Node) on January 11, associated with a Solar Eclipse in Capricorn on Jan 15. When the Sun is in Cancer, in July 2010, we will have a conjunction with the South Node (opposition to the North Node, as the nodes are always an axis) on July 4, associated with a Lunar Eclipse on June 26 and Solar Eclipse on July 11. When the Sun is in Libra, in September 2010, it squares the nodes on September 30 associated with a New Moon on October 7. When the Sun is in Capricorn, in December 2010 we see a conjunction with the North Node on December 24, associated with a Lunar Eclipse on Dec. 21. The Lunar Nodes move through each sign of the Zodiac in a little over eighteen months, so for a Moon Wobble to occur in the same sign and configuration with the Nodes it takes around 19 years. Each Moon Wobble pattern is thus unique until repeated some 19 years later. As Jim D'Amato points out, ancient astrologers associated the beginnings and ends of wars, major battles, mine explosions and animal stampedes with eclipses, both solar and lunar. These two types of eclipses generally happen about two weeks apart every six months and really make a notable splash once every two years. Tobey found that disasters happened about every three months; he correlated them as well to the geometric and mathematical square to the possible eclipse points, the Moon's Nodes. This is a clear indication of the stress and tension in the collective consciousness denoted by subliminal patterns marked by the interaction of the Sun and Moon when associated with the Moon's Nodes. Plato is reputed to have had the phrase "Let no-one enter who is ignorant of geometry" (ageômetrètos midèis eisitô) inscribed above the door to his Academy. This motto is more subtle than you might think! During these Moon Wobble periods, time and space seem to be more unstable, almost as if the fabric of the heavens has somehow weakened. People die – sometimes in great numbers – through dramatic releases of energy, especially explosions, fires, mass murders, earthquakes, floods and transportation accidents. For this reason, it makes sense to keep track of the Moon Wobble phenomena and to note where they fall in your own chart. Even though Tobey gave it an orb of 5 degrees (days), the effects of the Moon Wobble tend to appear some 10 days before the partile (exact) configuration, the peak date, and cease pretty much around 10 days after the peak date, especially when associated with major planetary aspects involving the outer planets. That makes a sensitive period of up to 20 days, four or five times a year, regular as clockwork. I'd say this is due to the wide orb of the Sun (17°), which moves on average slightly over one degree per day through the zodiac. Needless to say, disasters are not the exclusive province of Moon Wobbles (the massive 8.8 Mg earthquake in Chile on Feb 28, 2010 was not associated with a moon-wobble, although it was with the potent Full Moon in Aquarius that has been the trigger for widespread major weather disasters during March 2010), but they are disaster-prone phases, especially when associated with problematic planetary aspects, or with major retrograde periods. These phases bring suppressed tensions to the surface, both in human beings and in natural scenarios, often with catastrophic results. The effects on individuals depends on where the aspect falls in their charts, but by and large these phases are warnings to be appropriately prepared and not to undertake major decisions, as reality is clouded during these periods. It's worth ordering a forecast from us that will explain the potential effects of the Moon Wobble phases for the year ahead on your own life. Some notable example of disasters that occurred during the Moon Wobble phase will drive home the point. There is a very long list of them, far too many to list, although since October 2009 I have covered more, especially the manmade nasties, such as bombings and the like. Disasters occur not only in the lead up to malefic aspects around an eclipse or Moon wobble, but also as the affected degrees are subsequently activated. See Ian Thurnwald's detailed analysis of the aftermath of the massive Solar Eclipse in Aug 99 for examples of this. The location of disasters indicated tends to follow the path of the preceding eclipse, as this has already been sensitised, the cosmic fabric having been weakened, so to speak (see, for example, the January 2009 eclipse and the July 2009 eclipse; more detail with links can be seen on our Eclipse pages). So given the vast sums involved in researching and predicting storms, earthquakes, tsunamis and the like, not to mention the horrendous costs of cleaning up, it might be worth the authorities investing in some astrological research and qualified staff. This would be worth much much more than the cost. 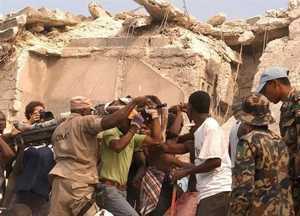 • Feb. 3, Congo: 45 killed and about 450 injured after two strong earthquakes, of 6.0 and 5.0 Magnitude. • Feb. 5-6, U.S.A..: 55 killed and hundreds injured after violent tornadoes rip through southern United States. • Feb. 7, U.S.A.: explosion at sugar refinery near Savannah, Georgia kills 14 and injures many more. • Feb. 21, Venezuela: Passenger plane crashes into mountain in Sierra La Culata National Park killing all 46 aboard. • May 12, China: Sichuan Earthquake killed nearly 100,000, leaving 4.5 million homeless. • May 13, India: 80 people killed in serial bomb blasts in Jaipur. • July 24 Japan: 90 injured & thousands of homes lose power in a 6.8 Magnitude earthquake near Iwate. • July 26 India: 57 killed in Ahmedabad after 18-odd synchronised bombs went off in less than 2 hours. • July 27 S.E. Europe: major flooding in Ukraine and Romania kills 18 causing $300 million in damages. • Aug 1 Pakistan: avalanche on K2, world's second-highest mountain, kills 11 climbers, injures others. • Aug 4, India: 150 die as landslide rumours cause stampede in Hindu Goddess fest. at Naina Devi temple. • Aug 5, N. California: 9 firefighters die in helicopter crash/burn in Shasta-Trinity Nat. Forest. Cause unknown. • Aug 10, Canada: explosions at gas facility force thousands in Toronto to evacuate. Some injured, 1 dies. • Aug 20, Spain: 153 die as passenger plane skids & bursts into flames during takeoff in Madrid. • Aug 23, U.S.A.: 12 die & thousands of properties flooded as trop. storm Fay makes landfall 4 times in Fl. and Ga.
• Oct. 29, Pakistan: 6.4 Magnitude quake hits S.W. Pakistan, kills 170 & wrecks 15,000 homes. • Oct. 30, India: explosions in Assam kill 55 and wound over 200. • Nov 7, Haiti: 90 students die & over a hundred injured in school collapse in Port-au-Prince. • Nov 9, Sea of Japan: 20 die and 21 injured in Russian submarine fault. • Jan. 24, France & Spain: 15 die & a million homes without power as 100 mph winds hit; worst storm since 1999. • Jan. 26, Turkey: avalanche slams 17 Turkish hikers on Mt Zigana, dragging them 1,640 ft, killing 10. • Jan. 27-28, S.W. U.S.A.: 23 die in severe storms. Schools close; a million homes left without electricity. • Feb. 9, Australia: over 160 die when arsonists start about 400 wildfires—some of the worst in Australia's history. • Feb. 10, U.S.A.: cluster of tornadoes rip through Oklahoma, killing 8 and injuring over a dozen. • Feb. 12, U.S.A.: 50 passengers and crew die as flight from Newark crashes near Buffalo, killing 1 on the ground. • Taurus Sun sq Nodes Apr 24 • April 6, Italy: earthquake Magnitude 6.3 kills 200, injuring 1,000. Town of L'Aquila is the epicentre. • For a list of other disasters, fires, earthquakes etc: Natural Disasters News for April 2009. • June 30, Italy: freight train derails and crashes into small town, killing 12, injuring 50. LNG container explodes. • June 30, Indian Ocean: Yemeni Jet hits ocean trying to land at Comoros. 152 killed; 1 survivor, a 14-year-old girl. • July 6, China: ethnic riots in Urumqi between Muslim Uighurs & Han Chinese & the police kill 156. • July 15, Iran: Caspian Airlines plane crashes en route to Yerevan, Armenia, killing all 168 passengers. • For a list of other disasters, fires, earthquakes etc: Natural Disasters News for July 2009. • July, India: massive flooding in India kills scores and leaves hundreds of thousands homeless. • July 24, Iran: 16 die as Aria Air flight skids off the runway, catching fire in Mashhad, Iran. • For a list of other disasters, fires, earthquakes etc: Natural Disasters News for August 2009. • August 7, Philippines: 22 tourists on Mount Pinatubo trapped and killed in heavy rain, flooding & landslides. • August 8, New York: helicopter and plane collide over Hudson River, killing all 9 on the private plane. • August 10, Taiwan: Typhoon Morakot causes mudslide burying schools, homes, killing 600. • Sep 30, Indonesia: thousands die, buildings destroyed in Mg. 7.6 quake near Padang, Sumatra. Massive aftershocks. • Oct 1, Indonesia: further death and destruction in Mg. 6.6 quake near Bengkulu, Sumatra. • Oct 2, Tonga: further deadly quakes in the region, including Mg. 6.1 near Hihifo, as undersea volcano erupts. • Oct 5, India: millions affected, hundreds dead in worst flood on record across Central India. • Oct 7, Thailand: 40 injured, 4 killed in terrorist bomb attacks in South Thailand. • Oct 8, Indonesia: asteroid explodes over Bone, Sulawesi, with 2 to 3 times the force of Hiroshima & Nagasaki atom bombs. • Oct 10, Pakistan: climax of weeklong violence, attack on Pak GHQ Rawalpindi; 11 soldiers & 4 Taliban die, many wounded. • Oct 10, Nigeria: over 70 killed as fuel tanker flips & explodes in Anambra. • Oct 11, Cambodia: 17 killed after river ferry capsizes on a tributary of the Mekong. • Oct 12, Pakistan: car bomb in Shangla marketplace kills 41. Pakistani jets bomb Taliban camps kill 17. • Oct 13, Nepal: 4,000 families displaced; 152,000 affected, 62 die; houses, crops destroyed in W. Nepal floods, landslides. • Oct 15, Pakistan: coordinated series of terror attacks focusing mainly on Lahore kill 39. Pakistani jets bomb Taliban, kill 60. • Oct 16, Iraq: 12 killed, 70 injured by suicide bomber in Sunni mosque at Tal Afar, near Mosul. • Oct 18, India: At least 33 killed in Tamil Nadu as explosion sets fire to firecracker warehouse. • Oct 18, Mexico: Hurricane Rick, massive cat. 5 storm produces 180mph winds & 50' waves; heading for Baja California. • Oct 19, Austria: Hailstorms decimate wild animals; thousands killed; hunting banned;$100 million damage to crops, property. • Oct 19, Thailand: Remotely detonated motorcycle bomb injures 24 in marketplace at Yala. Muslim separatists blamed. • Oct 21, Pakistan: 4 die, 18 wounded in twin blasts at International Islamic University, Islamabad. Taliban claim responsibility. • Oct 21, Yemen: Dozens killed as Saudi forces clash with Houthi rebels in North Yemen. • Oct 21, India: At least 21 die & 20 injured when trains collide near Agra, en route to Delhi. • Oct 22, Hindu Kush: Strong earthquake (mg 6.2) in towering Hindu Kush mountains shakes eastern Afghanistan and Pakistan. • Oct 23, Pakistan: Terror blasts rock Peshawar, Islamabad, Mohmand (nr Ghalnai); at least 21 killed, many injured. • Oct 25, Afghanistan: 2 chopper crashes in South & West of country kill 14 US soldiers, injure 26 (14 Afghan, 12 US). • Oct 25, Iraq: Coordinated suicide bomb blasts in Baghdad kill 155, injure 500. Al-Qaeda blamed. • Oct 28, Pakistan: Massive car bomb kills 91, injures 200 in Peshawar market. Taliban deny responsibility. • Oct 28, Afghanistan: Suicide attack on UN quarters in Kabul kills 8. Taliban say this is the first of many to disrupt election. • Oct 30, USA: San Francisco-Oakland Bay bridge failure scares commuters as 5000 pounds of iron falls on traffic. • For a list of other disasters, fires, earthquakes etc: Natural Disasters News for October 2009. • Dec 17, UK; Europe: Blizzards in East UK and West Europe. Airports closed, vast traffic jams. • Dec 18, UK; Europe: Eurostar trains stuck in Channel Tunnel for days due to bad weather. • Dec 18, Malawi: Mg 6.4 quake kills 4, displaces 32,000; 3,000 children under 5 affected. • Dec 21, Montserrat: Soufrière Hills volcano on Caribbean island Montserrat erupts spewing vast plumes of ash. • Dec 18–23, W. Europe: 55,000 travellers trips cancelled or jammed in snowbound trains. Airports closed; flights out. • Dec 22, Fiji: Cyclone Mick creates havoc across Fiji, costs millions, damages schools, kills 4. • Dec 24–31, UK; Europe: Avalanches, traffic accidents kill several. Airports, ferries, trains cancelled; celebrations disrupted. • Dec 28, Philippines: Mayon Volcano erupts 500 km SE of Manila causing 48,000 to flee homes. • Dec 28, Montserrat: Soufrière Hills volcano on Caribbean island erupts again. • Dec 28, Colombia: 60,000 affected; wide material losses after 48 hrs heavy rain NW Colombia. • Dec 29, Mexico: Mg.5.8 quake in Baja California rocks U.S.-Mex border region, felt 100 miles west in San Diego. • Dec 29, Australia: Floods destroy property, threaten lives in NSW and Qld (E. Coast), fires ravage WA (W. Coast). • Dec 30, West Australia: Wildfires destroy 40 homes, scorch 33,000 acres of land north of Perth. • Dec 31, USA: Disaster area declared in Kansas due to storms. • Dec 31, Afghanistan: Suicide bomber kills 7 CIA operatives, wounds 4 at US Base near Pakistan border. • Dec 31, Afghanistan: Roadside bomb kills 5 Canadians, injures 5 near Kandahar. • For a list of other disasters, fires, earthquakes etc: Natural Disasters News for December 2009. • Jan. 1, Brazil: 60 die, many injured as hillside collapses, destroying houses at resort near Rio. • Jan. 2, Colombia: Galeras volcano erupts. Red Cross says 8,000 need to be evacuated. • Jan. 2, Congo DR: Volcano Mt Nyamuragira erupts 25 km from Goma (pop. 600,000). Lava threatens people, chimps. • Jan. 2, Pakistan: 75 killed, scores injured by Taliban suicide bomber at volleyball match in NW Frontier province. • Jan. 3, Tajikistan: 20,000 left homeless as Mg.5.3 quake strikes Pamir Mountains near Afghan border. • Jan. 3, Australia: Massive flooding in northern NSW hits hundreds of farms. 1,200 evacuated. Stock losses. • Jan. 3, Philippines: Mg. 5.3 quake hits Mindanao Island 102km SE of Davao. • Jan. 3, Mexico: 2 more earthquakes (Mg.3.1 & 4.0) strike Baja California; felt in San Diego. • Jan. 3, Solomon Is. : Mg. 6.3 quake 100km SSE of Gizo, then aftershock Mg. 7.2 an hour later in same area. • Jan. 4, USA: Mg. 4.1 quake shakes Cedar City Utah; Mg 4.1 quake shakes Redway, NW of Sacramento California. • Jan. 5, USA: Bad weather freezes Eastern States from Florida up. Major crop damage. Has been serious since solstice. • Jan. 5, Costa Rica: 11,000 ft Turrialba volcano (last active 19th C) erupts, spewing ash and steam. Families evacuate. • Jan. 6, USA: Frigid weather hits mid-west. Blizzards, snowdrifts, chill factor of –52 reported Nebraska, N. Dakota. • Jan. 6, UK: England freezes: traffic accidents, transport delays, animal deaths; sea freezes in Dorset; 10,000 schools shut. • Jan. 6, Sthn Ocean: Sea Shepherd protest boat Ady Gil hit by Jap. whaler Shonan Maru 2. International incident feared. • Jan. 7, Sudan: Ethnic clashes kill 140, wound 90 in S. Wunchuei region. 30,000 cattle stolen. Civil war threatens. • Jan. 7, N. Europe: Big freeze kills; Eurostar stranded in Channel Tunnel. Flights disrupted UK, France, Ireland, Netherlands. • Jan. 7, Germany: At least 9 homeless men have frozen to death. • Jan. 7, Sweden: Temp. in central Sweden plunges to –40°C, coldest weather in 25 years. • Jan. 8, Angola: 3 killed, 9 injured in rebel ambush of bus carrying Togo International football team in northern province. • Jan. 9, USA: Mg 6.5 quake shakes N. California. Power out for 25,000 at Eureka, jumble of debris. • Jan. 12, Haiti: Mg 7.0 quake shatters Port-au-Price. Thousands die; tens of thousands of homes lost; worst quake ever in Haiti. • Jan. 12, New Guinea: 40 die, 8 injured when 2 buses collide on the Highlands Hwy, 100km from provincial capital Lae. • Jan. 13, Guatemala: Mg 6.0 quake 60 miles SE of Guatemala City on Pacific coast near El Salvador. No casualties reported. • Jan. 14, Afghanistan: Suicide bomber kills 20 in busy marketplace town of Dihrawud, in central Uruzgan province. • Jan. 15, Venezuela: Mg 5.6 quake near coastal town Carupano. No casualties reported. • Jan. 16, Argentina: Mg 6.1 quake 220 miles SE of Ushuaia, between Argentina and Antarctica. No casualties reported. 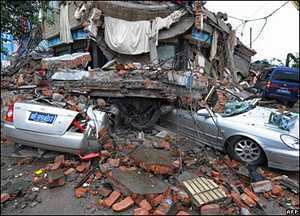 • Jan. 17, China: Mg 3.4 quake & mudslides in SW Guizhou province kill 7, injure 9. • Jan. 18, Cayman Islands: Mg 5.8 quake struck 40 miles from George Town. No casualties reported. • Jan. 18, Egypt: Torrential storms, floods on Red Sea coast & Sinai kill 7, many missing. Hundreds of homes destroyed. • Jan. 18, Ecuador: Tungurahua volcano erupts 180 km south of Quito, spewing ashes and lava. Evacuations, no casualties. • Jan. 18, Afghanistan: Taliban attack Kabul in major assault. Suicide bombers & gunmen occupy buildings, battle security forces. • Jan. 19, USA: Lone gunman kills 8, downs police helicopter, near Appomattox, Virginia. • Jan. 19, Japan: JAL, Asia's largest airline, files for bankruptcy protection, owing $25bn. Will cut 15,700 jobs. • Jan. 20, Haiti: Mg 6.1 aftershock shakes Port-au-Prince after 8 days of chaos, many smaller shocks. • Jan. 20, USA: Hundreds in fire-ravaged areas ordered to evacuate across California as powerful storm batters region. • Jan. 21, USA: Rain, snow, tornados pulverise S. California in 5th day of extreme weather. Power outages. Mudslides threaten. • For a list of other disasters, fires, earthquakes etc: Natural Disasters News for January 2010. • Feb. 27–Mar. 25: Massive Earthquakes and bad weather have struck worldwide so far this month, notably the 8.8 Mg quake near Concepcion in Chile on Feb 27, which killed some 500 people and wrecked thousands of homes. However, these are not associated with the moon-wobble phenomenon, although the quake chart had Saturn conjunct MC, with nodes rising right on the ascendant/descendant axis almost to the minute. Chile's natal chart was heavily afflicted, with natal Moon in the nodal degree, as well as quake Moon in the nodal degree. Chile's chart has its own nodes rising conjunct the ascendant to within a degree. This was one of the worst quakes ever recorded. Too much info for this section, but I hope to do an article outlining the cosmic factors and protections that reduced the evils to a manageable situation, unlike in Haiti, where the gods took their toll in full. • Mar. 26, USA: Mg 3.4 undersea quake strikes Channel Islands off Sth California near San Miguel Island. Largest of 4 quakes in Channel Islands & Santa Monica Bay in past week. • Mar. 28, China: 153 miners trapped by flood & collapse in Wangjialing coalmine, Shanxi province. Number killed unknown. • Mar. 29, USA: Strong low system over Ohio Valley continues violent storm activity into Mid-Atlantic. Injuries; houses damaged. • Mar. 29, Bahamas: Tornado kills 3, injures 4 at Freeport, western Grand Bahama. Trees uprooted; hotel windows blasted. • Mar. 29, Korea: S. Korean 1,200-ton corvette Cheonan sunk by suspected N. Korean torpedo. 40 sailors killed. • Mar. 30, USA: Record-breaking rainstorms flood Eastern Coast from Miami to New York. Storm surges warned. • Mar. 31, USA: Flooding on scale rarely seen in New England forces hundreds from homes, washing out bridges & highways from Maine to Connecticut. Rhode Island hardest hit by worst floods in 200 years. • Mar. 31, Iceland: Volcano under Eyjafjallajokull glacier in south Iceland forms new craters spewing lava; began erupting 10 days ago, forcing hundreds to evacuate; flights diverted. • Mar. 31, Russia: 2 suicide bombers kill 12 near Dagestan/Chechnya border. Russian govt. battles Islamist insurgency in Nth Caucasus. • Apr. 1, Mexico: Dozens of gunmen in coordinated attacks target 2 army garrisons in northern Mexico; firefights kill 18 attackers. • Apr. 2, Iraq: Gunmen in Iraqi military uniforms raid homes in Sunni village south of Baghdad, kill 25, execution-style, including 5 women. • Apr. 2, Pakistan: Govt planes bomb insurgents, kill 18 in Orakzai, in NW province. • Apr. 3, Australia: Chinese coal-carrier Shen Neng 1 aground on pristine Douglas Shoals, Great Barrier Reef east of Great Keppel Is., Queensland. Breakup & oil-spill threatens. • Apr. 3, Russia: Pres. Lech Kaczynski & many of Poland's highest military & civilian leaders die as presidential jet crashlands in thick fog in W. Russia, killing 96. Poland declares week of national mourning. • Apr. 4, Mexico: Mg 7.2 quake 19 miles SE of Mexicali, on US/Mex border; biggest in region in 18 years. Major damage, 2 killed in Calexico 1000 aftershocks & "triggered" quakes on both sides of border. • Apr. 5, Worldwide: Sharp gust of solar wind carrying charged particles hits Earth's magnetosphere at approx 0800 UT, sparking strongest geomagnetic storm in 4 years. • Apr. 5, USA: Swarm of small quakes at a Mount Redoubt volcano 100 miles SW of Anchorage, Alaska, threatens eruption. • Apr. 5, Pakistan: Taliban suicide bombers kill 8 at US Consulate in Peshawar; earlier suicide attack kills 41 in NW Province. • Apr. 5, USA: Explosion rocks coalmine in Montcoal, W. Virginia; kills 12 & traps at least 10 thousands of feet underground in worst U.S. mine disaster since 2006. • Apr. 5, Brazil: Worst rains in Rio's history bring floods, mudslides, kill over 100; 300,000 homeless. • Apr. 6, Indonesia: Mg 7.8 quake at 5:15 AM 125 miles northwest of Sibolga in Sumatra. Tsunami warnings later withdrawn. • Apr. 6, Iraq: Wave of terror bomb attacks kill 100, wound 160 in Baghdad & across country. • Apr. 6, India: 73 police killed as 700 Maoist guerrillas in Chhattisgarh (East Central India) ambush 120 personnel with bombs & gunfire. • Apr. 7, Kyrgyzstan: 100 killed, 400 wounded in as police open fire on thousands of protesters at Bishkek. • Apr. 8, Brazil: Mudlsides bury 200 in worst rains in Brazil, destroying homes in Niteroi near Rio. • Apr. 9, Pakistan: Pak troops kill 54 insurgents in airstrikes in Orakzai. Scores of militants slain in recent days in NW province nr Afghan border. • Apr. 10, USA: Mg 4.5 quake rattles San Diego in swarm of seismic activity, after Mg 7.2 quake on Mexican border last week. • Apr. 11, Solomon Is: Mg 7.1 quake hit south-west of Kira Kira island in the South Pacific, about 130 miles south-east of the capital Honiara. • Apr. 11, Thailand: Tourists warned after worst political violence in two decades kills 21, injures 874 in Islamic uprising in South Thailand. • Apr. 11, Ireland: IRA dissidents detonate bomb outside British spy HQ in Northern Ireland, protesting new local Justice dept. 50 evacuated. • Apr. 11, Italy: Landslide derails train in Northern Italy, kills 9, injures 28. Cascade of rocks, debris slam into train near Austrian border. • Apr. 12, USA: Mg 4.0 quake strikes off Humboldt County, northern California. No immediate reports of injuries or damage. • Apr. 12, Spain: Mg 6.2 quake strikes near Granada 320 km south of Madrid, but is deep underground, so little damage expected. • Apr. 13, Peru: Huge glacier breaks off, plunges into lake in Andes near Carhuaz, 200 miles north of Lima; 23-metre tsunami destroys town. • Apr. 14, India: Cyclone in West Bengal and Bihar kills 68, destroys 60,000 homes in North Dinajpur district, about 600 km north of Kolkata. • Apr. 14, China: Mg 7.1 quake kills 1100, injures 10,000, destroys villages in Qinghai province, near Tibet. Series of massive quakes in quick succession flatten buildings, bury thousands. • Apr. 14, Iceland: Volcano under ice in South erupts again. 800 evacuated. Smoke disrupts UK air traffic. Thousands stranded as flights grounded. • Apr. 15, Myanmar (Burma): Ethnic rebel bombs hit Yangon (former capital aka Rangoon) kill 9, injure many more at New Year celebration. • Apr. 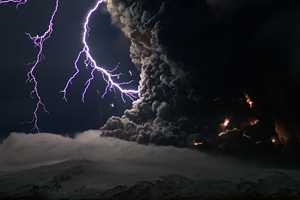 15, Europe: Deadly volcanic ash from Iceland grounds flights to & from UK & Europe. Travel delays across globe as flights cancelled. • Apr. 20–Jun. 16: Since the massive Deepwater Horizon oil spill on April 20, which remains an ongoing environmental and economic catastrophe, there have been a very large number of natural and manmade disasters, too many to list, with the worst being floods and landslides in China, Myanmar, Kyrgyzstan, US, Brazil, Australia, deadly cold in South America etc. These are not directly associated with the Moon Wobble, but with other infrequent problematic developments in the cosmos, such as the conjunction of Jupiter and Uranus with the malefic fixed star Scheat at the Aries Point, combined with the impending Cardinal Grand Cross that also features Saturn in Libra, Pluto in Capricorn, Nodes in Cancer/Capricorn and other nasties leading up to the Cardinal Climax on July 31, 2010. This current eclipse cycle is associated with this Cardinal Cross and subsequent Climax. • Jun. 21, China: Huge floods in South kill at least 175, displacing 800,000. Many injured & missing; vast crop & property destruction. • Jun. 21, Congo: 60 killed, 450 injured in rail accident 60 km from Pointe-Noire, Congo's second city, main commercial centre & port. • Jun. 22, Brazil: Severe flooding decimates towns in Northeast, killing at least 41 & leaving over 120,000 homeless. • Jun. 22, Turkey: 5 killed, 12 wounded in Kurdish rebel bombing of bus in Istanbul. • Jun. 23, Canada: Thousands flee offices as mg 5.5 quake hits capital Ottawa, shaking Toronto & Montreal. Felt in New York. No casualties. • Jun. 23, USA: Obama dismisses Gen. McChrystal from role in Afghanistan due to insubordination. Gen. Petraeus takes command. • Jun. 23, Spain: 12 killed, 14 injured in rail accident at Castelldefels, south of Barcelona. • Jun. 24, Australia: Prime Minister Kevin Rudd overthrown in "palace coup" by his deputy, Julia Gillard and treasurer Wayne Swan. • Jun. 25, China: Deathtoll from floods in South climbs to 377. Millions displaced, hundreds missing; $11 billion in damages so far. • Jun. 25, Bangladesh: Lancet documents "largest mass poisoning in history" as 77 million in Bangladesh exposed to toxic levels of arsenic. • Jun. 26, India: 23 killed, 25 injured as bus collides with truck in Bihar, east of country. • Jun. 27, Mexico: 9 killed in attack by gunmen on rehab centre in Gomez Palacio, north of country. Drug cartel suspected. • Jun. 28, China: 100 buried in landslide at Dazhai, Guizhou prov. Rains & floods kill hundreds, displace millions this month in S. China. • Jun. 28, Senegal: 11 killed in terrace collapse in Matam in north of country, while watching Senegal-South Korea football match on TV. Many injured. • Jun. 29, Iraq: 8 killed including Iraq Army general in series of bomb attacks by militants. • Jun. 29, India: 26 police killed in Maoist Naxalite rebel attack in central Chhattisgarh. Follows death of hundreds from attacks in April, May. • Jun. 30, Mexico: 6 killed, severe flooding as Hurricane Alex lashes Gulf Coast. Monterrey flooded, 12 tonne statue Virgin of Guadalupe topples. Alex also kills 2 in Guatemala & 2 in El Salvador. • Jul. 1, Turkey: 17 killed in Kurdish rebel attack on military base in SE Turkey. • Jul. 1, Pakistan: 41 killed, 174 wounded in suicide terrorist attack on Sufi shrine in Lahore. • Jul. 1, Japan: Toyota recalls 270,000 vehicles over engine fault. Follows 8 million recalled earlier this year over accelerator fault. • Jul. 1, Mexico: 21 killed in battle 12 miles south of Mex/US border between rival groups associated with drugs & people-trafficking. Police arrest 9. • Jul. 3, Congo: At least 220 die in fuel tanker accident in Sange, near Rwandan border, east of country. Scores injured as village burns. • Jul. 3, South Korea: 12 die, 12 injured as bus plunges from bridge near Incheon International Airport, 70km west of Seoul. • Jul. 4, Philippines: 15 killed, 48 injured in runaway bus crash on central island Cebu. Driver smashes into wall to avoid bystanders. • Jul. 4, Red Sea: Pirates hijack oil tanker MT Motivator with crew of 18 Filipinos, near strait between Red Sea & Gulf of Aden. • Jul. 5, Afghanistan: 64 militants & drug traffickers killed in Helmand province. 16 tonnes drugs seized + weapons, explosives, suicide vests. • Jul. 5, Thailand: Govt extends state of emergency in 19 provinces, including capital Bangkok, in fears of renewed violence. • Jul. 5, Romania: 10 (possibly 11) killed, 3 injured, in military training bi-plane crash close to Tuzla airport, just after take-off. • Jul. 6, Egypt: Disgruntled bus driver kills 6, wounds 16 near Cairo with automatic weapon. He was depressed, say reports. • Jul. 7, Iraq: Bomb attacks kill 50, wound 100 Shia pilgrims converging on shrine in northern Baghdad, say police. • Jul. 9, Pakistan: Suicide motorcycle bomber kills 102, wounds 115 in Yakaghund village in Mohmand tribal region, bordering Afghanistan. • Jul. 9, Afghanistan: Gunmen kill 11 wound 3 in ambush of Pak bus carrying Shia tribesmen on detour to avoid danger. • Jul. 10, Spain: 1.1 million demonstrators march in Barcelona to claim Catalan autonomy, as Spain is gripped with World Cup fever. • Jul. 11, Colombia: 12 rebels killed in midnight commando raid on FARC guerilla base, remote Tolima Mountains. 10 soldiers die in other battles. • Jul. 11, Uganda: 64 killed, 65 injured in twin blasts in capital Kampala. Rugby club & restaurant bombed as fans watch World Cup final. • Jul. 12, Haiti: 1700 displaced, some injured as electrical storm hits Corail-Cesselesse refugee camp north of Port-au-Prince. • Jul. 13, Russia: 233 drown, scores die from heat in past week. Many drown taking swim after too much vodka. Worst drought in 100 years; 19 regions declare state of emergency. Roads melting; crops shrivelling. • Jul. 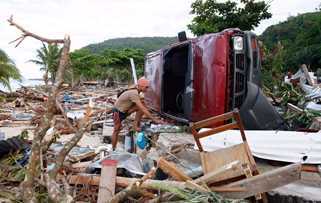 13, Philippines: 68 killed, 84 missing in Typhoon Conson, north of Manila. Manila blacked out; 3 vessels sink including LPG tanker. • Jul. 13, Japan: 2 killed, 3 injured in severe storms & landslide near Hiroshima. • Jul. 13, China: 41 die in rain-triggered landslides in Western China; over 100 killed by flooding this month so far. • Jul. 13, Germany: 3 killed, 11 injured in tornados & extreme weather; heavy rain & winds unroof houses. • Jul. 14, Iran: 30 killed, 100 wounded in twin suicide blasts at Grand Mosque in SE city, Zahedan. Wahabi extremists blamed. • Jul. 15, Chile: 2 strong quakes, Mg 5.3 (Tirua) & Mg 6.5 (300 miles S. of Santiago). Thousands flee in pre-dawn hours. • Jul. 17, Vietnam: 600 homes damaged, 43 boats destroyed, 17 missing as Typhoon Conson strikes. • Jul. 17, Pakistan: 18 Shia die in convoy ambush in Kurran tribal region near Afghan border. Sunni militants blamed. • Jul. 17, Puerto Rico: Mosquito-borne Dengue Fever epidemic kills dozens, sickens thousands across entire Caribbean. Hospitals overloaded. Authorities fear increase as rainy season advances. US secure so far. • Jul. 18, China: At least 38 miners killed in 3 separate accidents in dangerous coal mines. Lax safety blamed. • Jul. 18, Mexico: Pre-dawn gun attack on birthday party in Torreon kills 17, injures 10. Drug runners suspected. • Jul. 18, Argentina: 9 die in cold snap; more die in Bolivia, Chile, Paraguay & Uruguay. Patagonia temp: –14°C. Snow in Buenos Aires. • Jul. 19, India: At least 40 killed, 100 injured as passenger train ploughs into another at Sainthia station, W. Bengal. • Jul. 20, China: Flood update – 701 killed, 347 missing, 645,000 houses lost, 131 million people affected; 7 million hectares crops destroyed; $21 billion direct damage. What is the point of this table? Astrology is not all about prediction. It is also about research: honing our knowledge so we can make predictions about the future with more accuracy. That's how science works. Astrology is a spiritual science, but it also can be applied to mundane events in the world. This type of tabulation gives us a clue to the application of aspects and planetary alignments, in order to warn of future social and environmental problems before they happen. Astrology combined with relevant scientific observations can be a very valuable pointer and locator of natural and manmade disasters. The word "disaster" indeed means "ill-starred" in its original sense. NOTE: skeptical scientists usually deny any astrological effect, claiming that these conclusions are unscientific—the product of "random noise". See how Astrology differs from Astronomy. There is strong resistance in the scientific community to anything that smacks of astrology, "magical thinking", and (heavens!) the occult. This is what is known as a "paradigm clash". Well, funding is thin on the ground, and there is a lot of competition for it, but if astrological indications combined with scientific observations add strength to the forecasting process, we should not pooh-pooh the idea. Perhaps scientists should rethink their position. A pilot study is warranted, using skilled astrological practitioners; then we can find out just how useful it would be. Should the astrological indicators turn out neutral, then the weather bureaux can simply drop them, but should they turn out to give useful warnings well in advance (as this table suggests they would), this would be of immense value to society at large. I use The New American Ephemeris to predict dates of moon-wobbles and eclipses; and various media outlets and monitoring agencies to note disasters, particularly the BBC, and Topix.com, both of which track worldwide news very well. Global Disaster Watch is also remarkably useful, and there is a valuable Disaster Center on Twitter. Signe Quinn Taff's What Is Moon Wobble?